When it comes to choosing golf clubs, the decision is usually pretty simple…left-handed or right-handed? After that? Well, it gets a heck of a lot more difficult. Now, thanks to someone with no vested interest in any particular brand of golf clubs, getting the right set of golf clubs to fit your swing – and your game – has become a whole lot easier. Drummond Golf’s new MiMatch system, launched in April this year, could be the best 30 minutes you ever spend – off the golf course. And that’s because Drummond has entered the specifications of every major and most minor brands of golf club on the market into their MiMatch system. And after checking out all your specs – from grip and hand size and even finger length right down to what sort of shafts you need and even the size of the heads you need on your golf clubs to play your best golf, you are up and running. According to Drummond Golf’s product manager Kean Chai the non-brand bias is the major difference between theirs and so many other fitting systems on the market today. “As we deal with all the best brands in the golf industry, MiMatch uses club specifications and parameters supplied by these brands, to provide the customer with a totally unbiased list of golf clubs that best match their swing characteristics,” Chai told Golf Grinder. Chai says MiMatch has become a vital part of the way Drummond Golf fits and sells golf hardware. 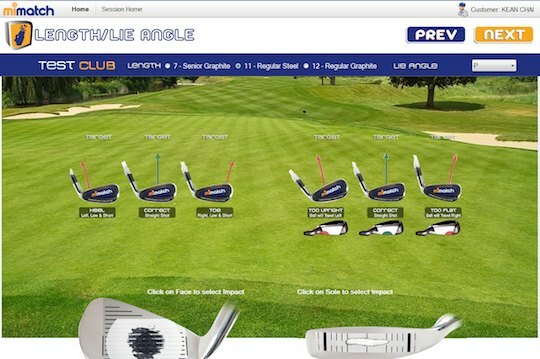 “There are more technical softwares available out there to fit golfers,” he said. Well there are at least 13 different brands of golf club to choose from on Drummond’s website alone. And each one of those brands may have at least four different models. That gives you at least 50 options before you start making decisions about flex, bias, loft, forgiveness and spin. Oh, and there’s also your budget. Then just let MiMatch look at your unique golfing characteristics and compare them against all the leading brands and then select the clubs that will fit you perfectly…and lift your game.